Dubai: Traders on UAE bourses waiting for a trigger has been selling at every recovery even as they eye the fourth results from banks. 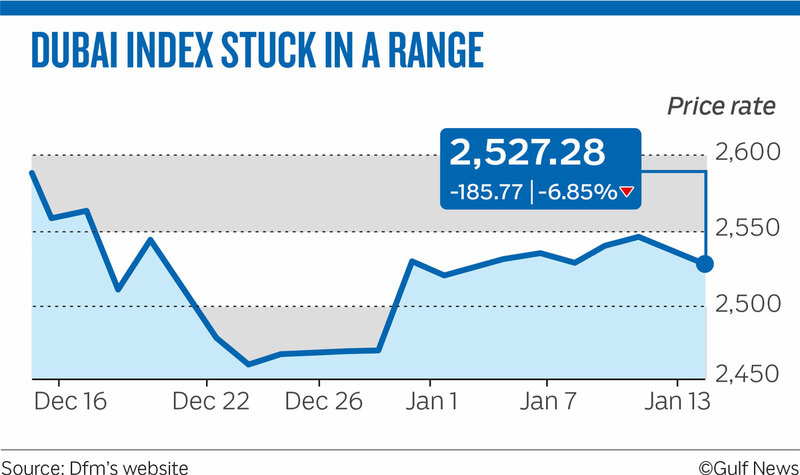 The Dubai Financial Market general index closed 0.41 per cent lower at 2,527.28. Traders on the UAE bourses have been stuck with loss-making positions hoping to see a recovery to at least see a break-even. They have been eyeing fourth quarter to December results from Emirates NBD, Abu Dhabi Commercial Bank among others which are scheduled to announce their results this week. Emirates NBD closed 0.99 per cent higher at Dh9.19. Dubai Islamic Bank closed 1.18 per cent higher at Dh5.14. Emaar Properties closed nearly 2 per cent lower at Dh3.98. Gulf Finance House closed 2.79 per cent lower at Dh0.906. Traded value came in at Dh100 million, down from the weekly average. The Abu Dhabi Securities Exchange general index closed 0.61 per cent higher at 4,999.23, closing in on the keenly watched 5,000 mark. “Abu Dhabi remains fairly quiet at this time pending earnings with something to look forward to from Dana Gas this week amid retreating oil prices and what seems to be a never ending tension spiral between the US and China that could impact global currencies and commodities,” Issam Kassabieh, Senior Financial Analyst at Menacorp said. “Trading is expected to pick up between the middle of January and end of February as more news surfaces,” Kassabieh said. First Abu Dhabi Bank (FAB) neared its all-time high of Dh15.20 amid consistent buying. FAB closed 1.65 per cent higher at Dh14.76, extending its gaining streak and rising 7 per cent over eight straight sessions. ADCB closed 0.61 per cent higher at Dh8.29. Elsewhere in the Gulf, Saudi Arabia’s Tadawul index closed 0.25 per cent lower at 8,270.55. The Muscat MSM 30 index closed 0.11 per cent higher at 4,308.74.